Pinterest confession: sometimes I feel like I can scroll for hours and not find anything I want to make. This was happening to me one afternoon, and Parker glanced over my shoulder and within 5 seconds said "make that" as he pointed to a recipe for philly cheese steak stromboli. When in doubt, consult the husband. I modified the original recipe to make it simpler and more fit to our tastebuds. This was a great weeknight meal that we both loved. It was simple to make and already had veggies cooked right in, so it very easily can be a one dish meal. I served mine with some sweet potato fries and that was that! Dinner is served. Directions: 1. Preheat oven to 400 degrees and line a large baking sheet with foil for easy clean-up. Lightly spray the foil with cooking spray. 2. In a large pan over medium-high heat, add vegetable oil and steak strips. Season with salt and pepper. Cook until pink starts to disappear and add in bell pepper and onions. Saute for 2-3 minutes or until onions are lightly browned. (Don't overcook the meat and veggies because they will still cook in the oven.) 3. Roll pizza dough out onto your baking sheet and spread to fill the entire sheet. Pour steak mixture into the center of your pizza dough, leaving about an inch on all sides so you can roll it. 4. Top steak mixture with cheese. 5. 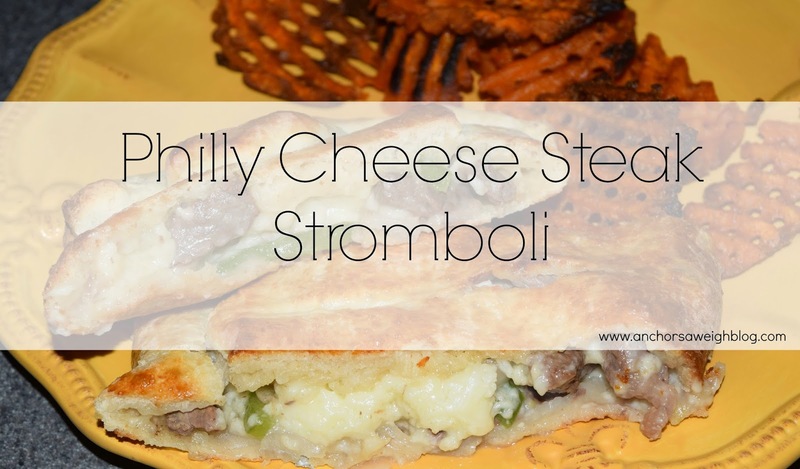 Fold the sides and ends over so that the stromboli is completely covered. 6. With your beaten egg, brush the outside of the loaf until completely covered with the egg. 7. Cut thin 2 inch strips on the top of the loaf and bake 15-20 minutes or until golden brown. 8. Cut and serve immediately with your favorite dipping sauce. We used ranch and loved it!